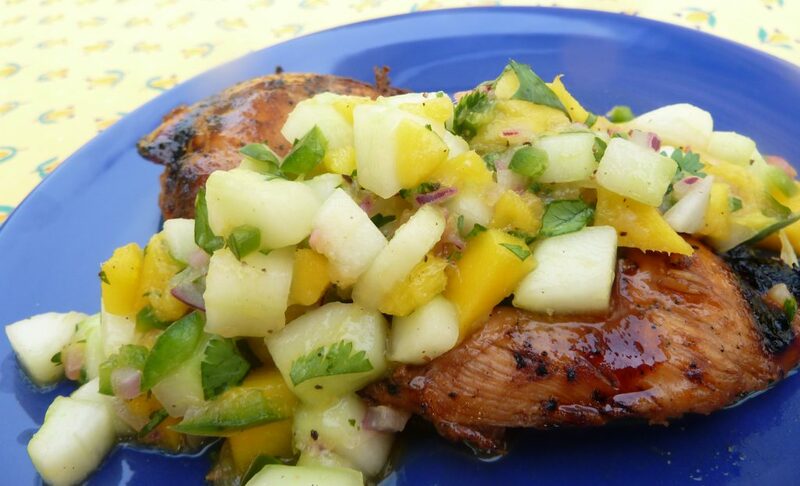 This simple Mango Salsa by Ellie Krieger is delicious and turns grilled chicken and fish into a magnificent meal. I usually add about a cup of cucumber, making it go farther and providing some crunchiness. Grilled chicken alone just isn't good enough anymore! 1/2 cup peeled, diced cucumber 1 tablespoon finely chopped jalapeño 1/3 cup diced red onion 1 tablespoon lime juice 1/3 cup roughly chopped cilantro leaves Salt and pepper, to taste Combine the mango, cucumber, jalapeño, red onion, lime juice and cilantro leaves and mix well. Season with salt and pepper.